Watch your in box for reminders and replays links – just in case you miss one of the “live” webinars. The log-in, or call-in instructions will be sent to you shortly. You will also receive a reminder on the day of the webinar. If you don’t see our email, first check your junk folder. If you still don’t see the email, fill out the form again to have another copy of it sent to you – be sure to include the correct email address. Please let me know if that still is not working. I know I’ve had some email issues and had to call my ISP to get the email whitelisted from a specific provider. Mon – Mary Rodwell. I get the reminders of the event but am looking for the replay’s. Finally! Found my people this past year! Thank you for helping me connect further! Looking forward to this webinar series and connecting with like mined guests. Found the link to this webinar the night before it starts…synchronicity…or something else! PS I am currently living in Chiang Mai Thailand. And we are missing a spiritual connection over here big time So we are really looking forward to this class After all I’ve never missed a WE meeting yet. 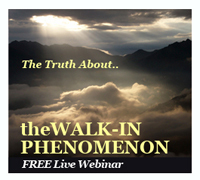 Hi Janis, Be sure to get registered for the webinars: https://adironndaspiritualhealer.com/walk-ins/walk-in-phenomenon/ All registrants will have access to the recordings for some time! I will be out of town the whole time of the webinars. will be be able to access them by replay after the event, or do i miss out completely?